Tourmalet is the name of our 2 bedroom gite, its name inspired by the impressive Col du Tourmalet, the highest road in the central Pyrenees. 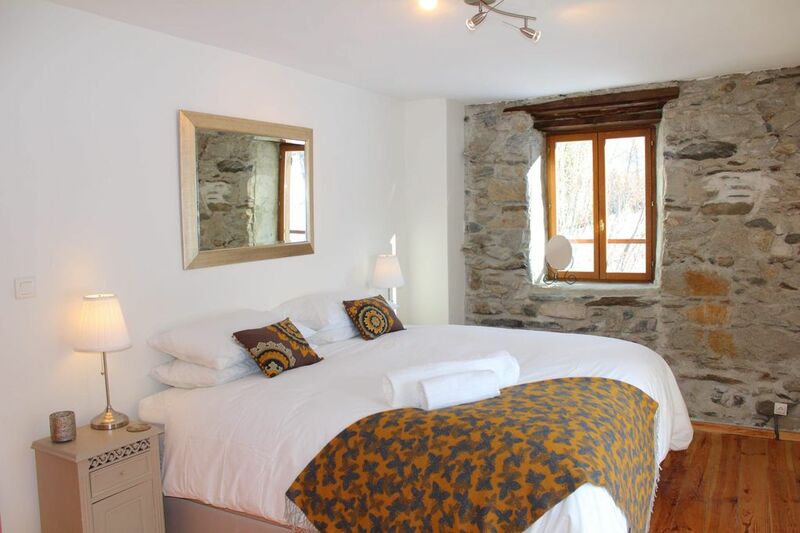 Our gite pays homage to this mythical climb and welcomes you to an interesting, lovingly restored former farmhouse dating back to the 18th century. There are 2 bright and beautiful bedrooms upstairs offering sumptuous beds and crisp white linen. One bedroom has a double aspect and Juliet balcony facing the babbling brook which will delight you with its soothing sounds of water tinkling over the rocks. The second bedroom faces down the valley with mountain views that enfold you and provide an ever-changing backdrop. The delightful bathroom is newly fitted with modern facilities and rain shower. Downstairs offers an open plan kitchen, living and dining area. The comfortable sofas and log burning fire provide solace at the end of an active day. Peaceful location in beautiful area, ideal for cycling and walking. Comfortable well -equipped gite in lovely gardens. Lots of thoughtful touches like seating areas in shade. Angela and Eric were friendly and helpful hosts. Lovely place to stay. Un petit coin de paradis dans un gîte super confortable (literie au top) et de très bon goût. La nature est là tout autour de vous pour de belles promenades et randonnées. Une mention particulière pour l'accueil de la maîtresse des lieux, Angela, sa gentillesse et ses petites attentions. Nous espérons pouvoir revenir bientôt. Merci beaucoup. C’était agréable de vous rencontrer.